The following policies apply to civilian contractors working on board military vessels. * Must be approved by the CO.
* Must receive training in shipboard emergency procedures. * Must be escorted at all times in Restricted Areas of the ship (noted in the room descs) unless a special pass is granted for a specific work area (must be approved by the appropriate Department Head and Master at Arms). * Must report to the nearest safe area (berthing, mess hall, rec room, etc.) if the ship goes to Condition Two or One. Two Double turrets. Four under alligator hull. Twenty double dual-Purpose guns capable of cannon fire and conventional missiles. Four heavy, bow-mounted forward guns. Numerous point defense, dual rapid-fire guns for fighter defense and defense against incoming missiles. Special Ops Information is Classified. Genesis was part of the BSG-41 Battlegroup. 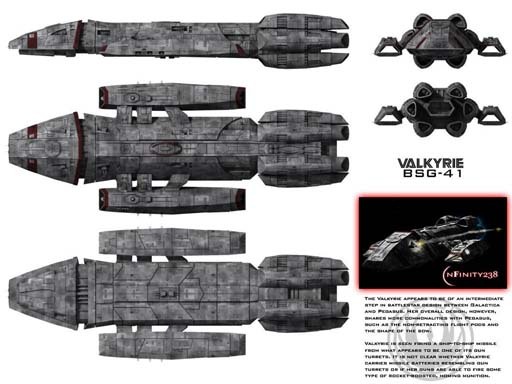 Commander Adama had this ship under his command before he was moved to the Galactica. This ship has capabilities that only the military are aware of at this time. They currently are on watch patrol at the Support Station PAS. 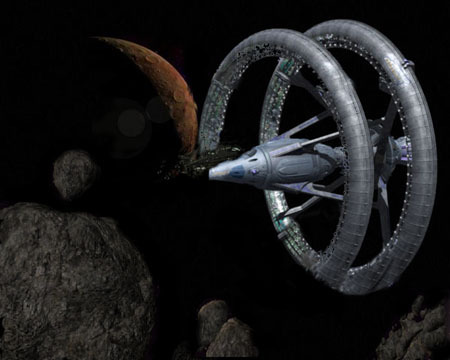 This is not an actual ship, but a base station that was built by the cooperative effort of three colonies: Picon, Aerelon and Sagittaron. Investments came from unknown businessmen on Caprica. This is a classifed station with military contact that sits above a barely habital planet. The Tracer is a Tyllium refinery ship, capable of taking raw Tyllium ore and processing it into the fuel needed for ships. It is also one of the most dreary and dangerous jobs. Tyllium refining is a hard, dirty job. Soot covers nearly every surface in the ship. Bins of Tyllium must be loaded and unloaded with only a minimum amount of mechanical assistance. The Tyllium itself is somewhat volatile, and special care must be taken against fires. Construction ship design was built off an old Colony design of Cargo ships, its main job is to carry a lot of supplies to the site and build defense turrets and space stations, where applicable. This ship holds around 20-25 crew. The training ships were used for cadets prior to being assigned to their permanent posting. The Hera not only was used as a training ship, but as a carrier to deliver fighters and supplies to forward bases and outposts. 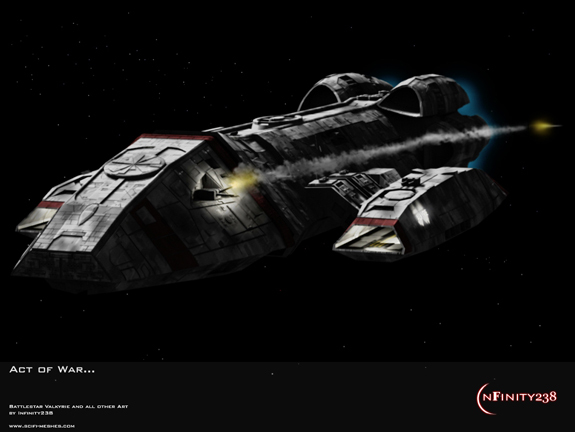 It carries the Colonial Asp - Training vipers - an intermediate flight trainer - Several dozen were still in use by the Colonial Flight School before the Cylon attack. Also, as the only military-grade craft on the civilian market, it has become a classic "Rich Man's Toy"- some examples selling for as high as Six Million cubits. A flattop is a type of salvage and repair ship in the Fleet, acting as a mobile spacedock. A Flattop-type ship is among the first vessels to join the Fleet (Miniseries). 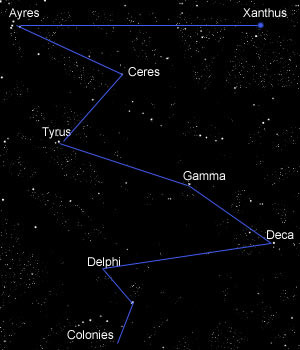 Later a flattop-type is among the ships with Galactica when New Caprica falls (Precipice). (civilian). During the war when many Colonial ships were forced to scuttle due to battle damage. It was decided to build a ship that could be used as a repair platform. The Forge class was so successful that they were still found in service at the time of the Cylon attack. The Carina is a floating Pyramid Sports Arena. It has the capacity to hold over 10,000 fans. The ship also caters to light tourism, as well as, sports events and training for the players. 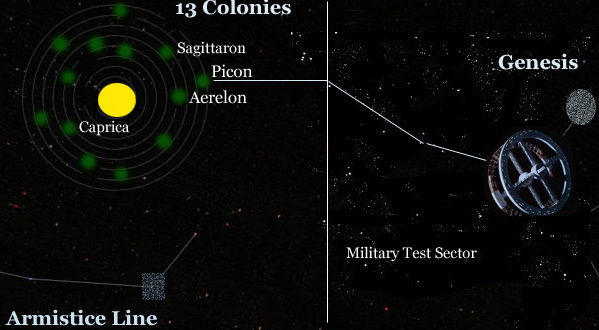 Image of the Colonies and the station info. Also, much thanks to those at Scifi-Meshes for the pics I found.